Orendorff & Associates is proud to once again support our local Special Olympics Athletes and Volunteers who contribute so much to our community. Orendorff & Associates, Sudbury's Personal Injury Lawyers were on hand this March taking in the action. It was nice to see that John Michael Bray and James Ross were once again able to defend their undefeated coaching record for the NHL Alumni over the Local Law Enforcement Squad. 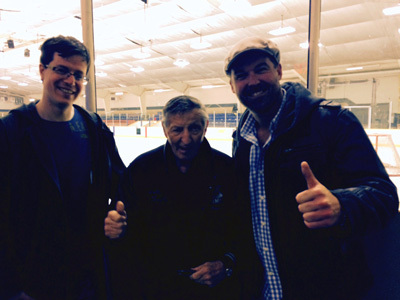 There was a good crowd at the Garson Community Arena and everyone had a wonderful time. 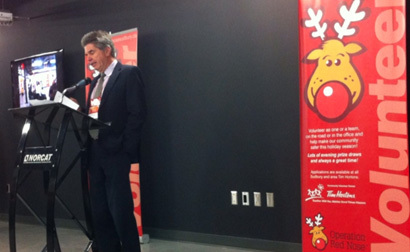 We salute the other national sponsors like Scotia Bank and Home Depot who help make this great tour and event such a positive experience for all. In addition to the evening's game, the post-game meal and sponsorship by Overtime Sports Bar and Grill was full of comradery and story-telling and all around good fun. The Team at Orendorff & Associates works effortlessly combining it's integrity, knowledge and experience with it's caring capacity to achieve success for their clients. Serving the Greater Sudbury region and Northern Ontario, Orendorff & Associates also offer French Language service by John Michael Bray. 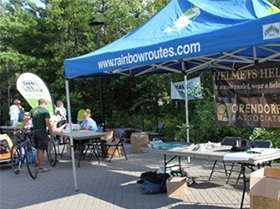 In July 2013, Orendorff & Associates helped Rainbow routes at the Northern Lights Festival Boreal at their Bike Valet booth. 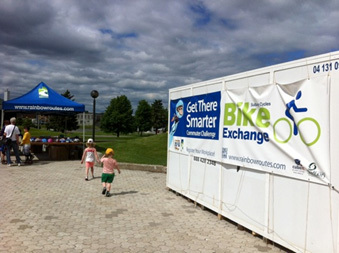 Families were encouraged to bike to the festival while being able to stow their bikes under the watchful and safe eye of both Rainbow Routes volunteers and Orendorff and Associates volunteers. In addition to this, the Sudbury Cycling Union was on hand to assist. Sharing a common goal of Safe mobility on our roads, the Festival was an enormous success with beautiful weather and fun for all. Thank you for visiting the valet station and riding safely. For those that arrive without helmets, Orendorff & Associates, Sudbury Personal injury lawyers were happy to supply helmets at no cost to visitors, with proper fitting and wearing instructions. 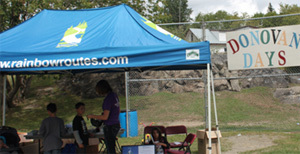 Summer 2013 marked the 2nd year Orendorff & Associates, Sudbury’s Personal Injury Lawyers sponsored the Rainbow Routes information booth at the "share the road" bicycle ride and education campaign. Share the road is a provincial initiative that works with local organizations to facilitate education in municipalities for all parties using city and provincial roads to share the road safely. Together with the team at Rainbow Routes, representatives of Orendorff & Associates were demonstrating safe cycling signals, proper fitting of helmets for the participants and spectators alike. Every year, unwanted motor vehicle accidents occur between cyclists and vehicles leaving people injured. Orendorff & Associates is committed to helping our community use the roads safely. Together with John Michael Bray, Michael Gauthier and James Ross, Tomm and the team at Orendorff & Associates represent injury victims in our community in a wide range of litigation matters. Serious injuries such as brain injuries or spinal cord injuries that occur in accidents are what insurance is in place to protect against. Orendorff & Associates represents only injured victims and their families in disputes against insurance companies. 2013 Share the road ride missed it’s celebrated local ski champ Devon Kershaw as he was unable to make the trip across the country. He was preparing for the 2014 Olympic winter games in Sochi and could not attend. We all wish him great Success at the Olympics ! See you in 2014 Devon at the share the road with your Olympic Story! 2013 also marked Orendorff & Associates' safety campaign to remind drivers using our roads to stay focused on the road while driving. Winter driving in particular can be treacherous, so in conjunction with the Greater Sudbury Fire Service local billboard message campaign, Sudbury’s Personal injury Lawyers at Orendorff & Associates have helped improve the presentation of the safety messages along our roads. As first Responders to car crashes and accidents, Greater Sudbury Fire Fighters know first hand the challenges people face when involved in car accidents and motor vehicle collisions. Orendorff & Associates see the unfortunate details of dealing with the long-term after effects of those incidents. 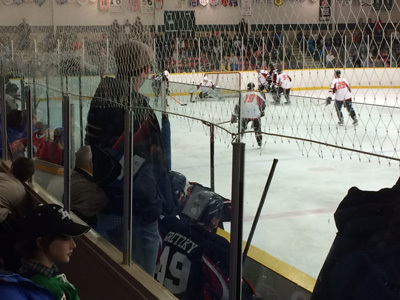 Orendorff & Associates was happy to be a sponsor of the Charity Hockey Game between the FireFighters and the Police in March of 2013. The game was a lot of fun and raised funds that stay in our community. 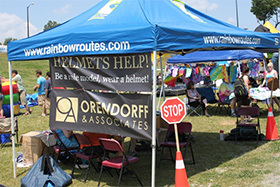 Orendorff & Associates was, for the second year, proud to be sponsoring and assisting with the Rainbow Routes annual Spring Bike Exchange in the spring of 2013. While great to see kids riding on our streets and in our neighbourhoods, what is even more important is the use of safety helmets to help prevent injury if an incident occurs. 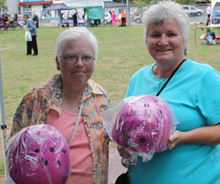 Together with Deb McIntosh the Executive Director of Rainbow Routes, Sudbury’s Personal Injury Lawyers, Orendorff & Associates was proud to help put helmets on kids and adults heads alike. OTLA is the Ontario Trial Lawyers Association and they are committed to putting helmets on kids in this province. More than 4000 children benefitted last year alone. Here in our own Community, we have lost count of how many helmets we have given away. Whether it is summertime and bike helmets are required or it’s a winter sport like skiing, snowboarding or sledding and warmer winter helmets are needed, Orendorff & Associates is committed to helping improve the safety in our community. 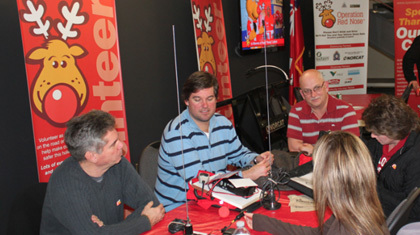 Operation Red Nose ran another successful campaign this year with their valued volunteers and patrons. As a member of OTLA (Ontario Trial Lawyers Association), Tomm Orendorff, Senior Legal Counsel with Orendorff & Associates, Sudbury's Personal Injury Lawyers for more than 30 years was please to represent the association, it's support and sponsorship of the initiative to help keep our roads safe and avoid the potential for accidents on our roads during a very busy and celebratory time of the year. On the second Saturday of the campaign, Tomm and his vehicle of senior members of his legal team took to the roads, responding to calls and tracked over 250km, finally turning in around 4am. The other team of volunteers that drove ORN patrons home were deemed the "younger" members tracked more than 125km and convinced themselves at staying up until 2am was enough for them. Monday morning when everyone collected at the office, it became apparent that the young team lost the bet and will have to wash dishes for 2013 until they get a chance to redeem themselves. It was great fun and more importantly, a commitment to keeping the roads of Greater Sudbury safe another holiday season. "Orendorff & Associates is proud to continue promoting safety in our Sudbury community," said Michael Gauthier of Orendorff & Associates. "This initiative is another way that our streets can become safer, reducing or eliminating potential injuries, and helping our fellow Sudburians. We are committed to improving safety in our community and on our streets for everyone, youth and adults alike. Accidents not only affect the injured victim, but their families as well." 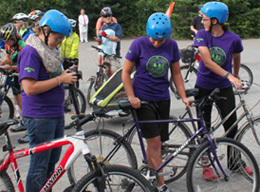 Rainbow Routes Association will continue to provide cycling safety education through the Sudbury Cycles Project at local schools and community events. 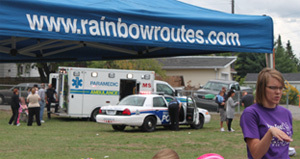 To support these efforts, visit http://www.rainbowroutes.com. 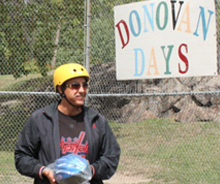 Donovan Days was a wonderful opportunity to continue to promote bike safety and Orendorff & Associates, Sudbury's Personal Injury Lawyers were pleased to partner with Rainbow Routes once again. 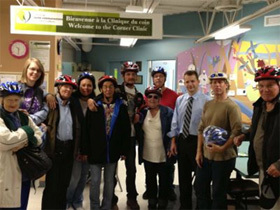 While Rainbow Routes was working hard to give bikes to youth, be they newly donated or fixed up bikes that needed a kids to ride them, the legal team and Lawyers from Orendorff & Associates, Tomm Orendorff, Micheal Gauthier and JM Bray were pleased to provide helmets to as many kids and parents as possible. Orendorff & Associates, whose practice used to be located in the Donovan on Frood Road were happy to meet old friends and see neighbours and look forward to doing it again. Although it is important for kids to wear helmets to help keep them safe, Orendorff & Associates also believe it is important for parents, guardians, grand parents, uncles, sisters and everyone riding with kids to wear helmets too! It has been the experience at Orendorff & Associates that serious injuries affect victims AND their families. Please take care and ride safe! 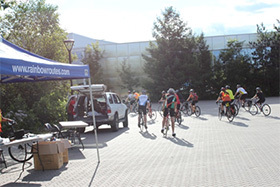 Orendorff & Associates , Sudbury’s Personal Injury Lawyers were out supporting the Share the Road Ride ensuring that every participant had a safety helmet to participate in the ride. Bike Safety and Road Safety are very important elements to avoiding collisions between motorists, cyclists and pedestrians. Share the Road is an Education movement to help facilitate awareness and improve safety on our roads. Together with Rainbow Routes, a local non profit organization dedicated to mobility and safety in our community, Orendorff & Associates continue to advocate in our community for improved safety, and driver focus on our roads. Motor Vehicle Collisions or Accidents (MVC or MVA), what ever you refer to them as, can be avoided. Spinal Cord Injuries, Paralysis and other catastrophic injuries, very serious injuries, which cause life altering challenges are what initiatives like Share the Road are trying to avoid. We have had injuries in our community that have affected the victims and their families and we will continue to work to reduce these terrible incidents. Thank you to Devon Kershaw for his leadership in this very important initiative of making our roads safer.